What Can a Mouthguard Do For You? Ask a Family Dentist in 46219! Did you know that every time a shark loses a tooth, it’s replaced within a day? Unfortunately, humans aren’t so lucky! We only get one set of adult teeth that have to make it through many decades of wear-and-tear. Sure, these days there are some great replacement options for missing teeth, but nothing is as good as your own! That’s why it’s well worth it to protect what you have. You already know that an athletic mouthguard can protect your teeth, but did you know that it can prevent more serious injuries as well? 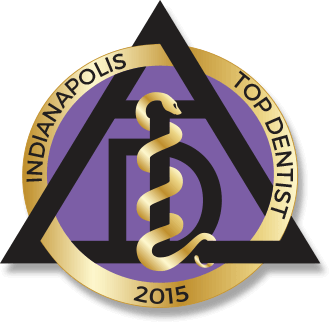 As a dentist in 46219, we’ve seen firsthand the many benefits to be had from this simple preventative measure. Learn more about it today! What Can a Mouthguard Do For You? In addition to preventing serious injury to the teeth and gums, a mouthguard has also been shown to prevent head and neck injuries! That’s right, researchers have found that wearing a custom-made mouthguard reduces the risk of concussions because it stabilizes the head and neck, reduces impact from a hit, and also keeps the head and neck from moving as much as they would otherwise. What’s the Best Way To Get a Mouthguard? The most effective type of athletic mouthguard is one that’s been custom-made for you. There are over-the-counter options, but they have several drawbacks such as being flimsy, ill-fitting and less protective. Furthermore, the extent to which a mouthguard can prevent injury depends on two factors: its thickness and how well it fits. In fact, a study from the Academy of General Dentistry found that football players who wore over-the-counter mouthguards were over two times as likely to get concussions or other head injuries than those wearing a custom-fitted one. 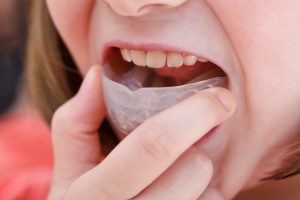 Given what we know about what makes a mouthguard effective, it’s worth it to have one made by a family dentist serving Warren Park so that it works as reliably as possible. How Easy Is It To Have a Mouthguard Made? At the first visit, molds of your teeth are taken and sent to a dental lab. After 1-2 weeks, you’ll return to pick up your mouthguard. Any necessary adjustments will be made to make sure it feels snug and comfortable. Finally, you’ll be given instructions on caring for your new mouthguard so it lasts for many years. An accident or injury can happen at any time. When it comes to protecting your healthy set of teeth, it’s better to be safe than sorry! When it comes to oral injuries, Dr. Mark Farthing and Dr. Armin Tepner understand the importance of using simple preventative measures. As such, they always recommend protective mouthguards to all of their patients involved in athletics. If you have any questions, they can be reached through their website or at (317) 898-3384. Comments Off on What Can a Mouthguard Do For You? Ask a Family Dentist in 46219!